Seoul and Tokyo will meet at the ASEAN Regional Forum. No inter-Korea talks are expected. South Korea’s Foreign Minister will meet with his Japanese counterpart but not his North Korean one this weekend, Japanese media outlets report. On Monday Kyodo News reported that Japanese Foreign Minister Fumio Kishida, U.S. Secretary of State John Kerry and South Korean Foreign Minister Yun Byung Se will hold a meeting on July 1st ahead of the ASEAN Regional Forum in Brunei next week. The report said the purpose of the meeting would be to coordinate their position on North Korea. Kyodo first reported the three countries were discussing a possible trilateral meeting between their top diplomats earlier this month. It will be the first time Japan, South Korea, and the U.S. foreign ministers have gathered since last September, before Japan and South Korea’s leadership transitions and John Kerry taking over as Secretary of State. The report from Monday also said that Kishida and Yun planned to meet bilaterally following their meeting with John Kerry. This converges with comments made by South Korea’s Ambassador to Japan, Lee Byung-kee, last week, following a meeting with Kishida. The trilateral and bilateral meetings are the clearest signs yet that relations between Japan and South Korea are thawing after being strained for months over a territorial dispute and Japanese Prime Minister Shinzo Abe’s controversial comments regarding Japan’s actions during WWII. Indeed, FM Yun had planned to visit Japan in April to meet Kishida but South Korea cancelled the trip after three members of Abe’s cabinet visited the controversial Yasukuni war-shrine. Following that decision and subsequent comments by Abe, it was announced that South Korean President Park Geun-hye would make China the destination of her second trip abroad after she visited the United States last month. The U.S. has been working behind the scenes for months trying to repair ties between two of its strongest allies in the region. These efforts have been paying off as a number of recent events indicate Tokyo and Seoul are seeking to get past the spat. 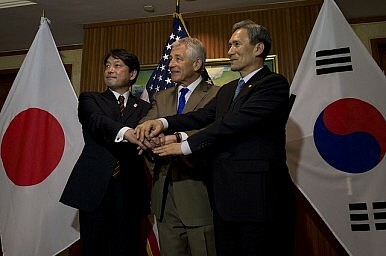 First, at the beginning of June, Japanese Defense Minister Itsunori Onodera his South Korean counterpart, Kim Kwan Jin, held a trilateral meeting with U.S. Defense Secretary Chuck Hagel on the sidelines of the Shangri-La regional security forum. North Korea was the topic of that meeting. That being said, North Korea is likely to dominate the agenda at the upcoming trilateral FM meeting as all sides work to restart the six-party talks between China, Russia, the U.S., Japan, and North and South Korea. The pace of low-level diplomacy between all the parties except Russia has increased considerably in recent weeks. North Korean Foreign Minister Pak Yi Chun is expected to attend the ASEAN Regional Forum next week however, a South Korean spokesperson told reporters on Tuesday that FM Yun did not intend to meet with him. The two sides did hold surprise meetings on the sidelines of the ASEAN Regional Forum in 2011. The two had agreed to a government meeting in Seoul earlier this month but it was cancelled after they failed to agree on which representatives to send to the talks. Meanwhile, on Thursday South Korean President Park will begin a highly-anticipated, four-day trip to China where North Korea is expected to be the top issue on the agenda.